Shakeel started with the Play Attention Programme in March 2013. Even at seven years old, Shakeel is a bit of a perfectionist, and not getting the results he wanted was frustrating for him. He didn’t know how to “zone in” on the task at hand given to him, and ignore all outside interferences in the classroom environment. After a few months of attending the Play Attention programme, the change in Shakeel’s concentration was noticeable. Shakeel has learned to control various behaviours that were not conducive to his focus, such as foot tapping, fidgeting and letting outside factors capture his attention. 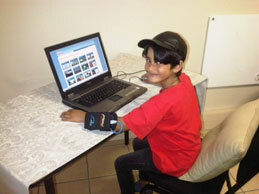 Shakeel works incredibly hard in every session and as a Play Attention Practitioner, I am extremely proud of him. We have worked on breathing techniques when his focus starts to dwindle, but the most noteworthy observation is that Shakeel very seldomly has to be prompted to “take a deep breath and relax” or “blink”; he recognises when he starts losing focus and implements behaviours to get back on track. At such a young age, I am taken aback by the amount of effort Shakeel puts into his sessions, as well as the responsibility he takes for his work. Working with him has been an absolute joy! Should your child or yourself struggle to focus or concentration, pay attention, fidget, zone-out of tasks, not able to complete tasks, please contact reception on 011-4503576 or info@psychmatters.co.za for a consultation with our Play Attention Practitioner.